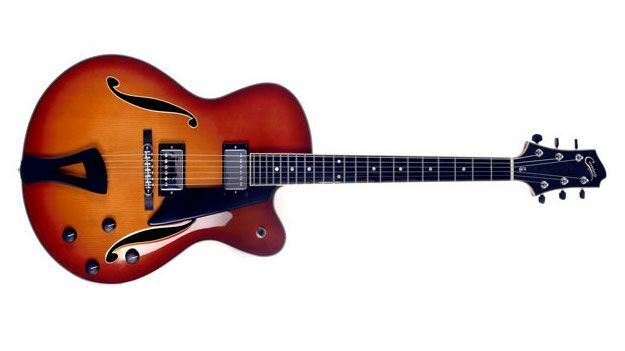 Comins Guitars has introduced the GCS-16 archtop, the newest design by luthier Bill Comins. The GCS-16 is the newest addition to the company’s Guitar Craft Series. The guitar features a laminated spruce top and laminated flame maple back and sides, an ebony fretboard and a medium “C” shaped neck. Other features include custom-wound Kent Armstrong humbuckers (one- and two-pickup versions are available), chrome hardware and Wilkinson tuners. The available finishes are Vintage Blond, Tangerine Burst, Violin Burst, Autumn Burst and Black. The GCS-16 is available for $2,199 (one pickup model) and $2,399 (two-pickup model). For more information, head over to Comins Guitars.